The key highlight on Aston Martin's upcoming hybrid hypercar is an all-new fire-breathing naturally-aspirated V12 which revs to a manic 11,100rpm! The Brits seem to be on top of the hypercar game this season, with brands like McLaren spearheading the phenomenon till now. Now though, it's Aston Martin's turn to be under the spotlight. 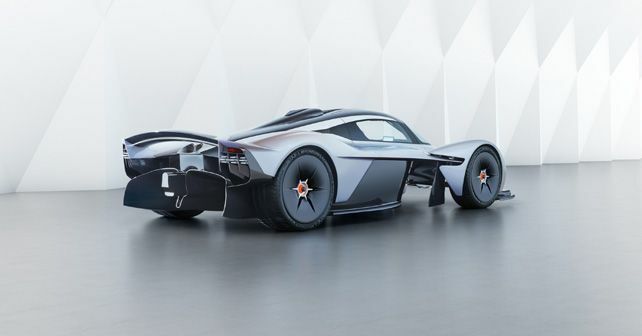 The British giant, which introduced its hybrid hypercar dubbed 'Valkyrie' at this year's Geneva Motor Show, has broken the seal on the performance specs of the production-ready version of the hypercar. With Red Bull’s Adrian Newey and Aston Martin’s chief designer Marek Reichman at the helm of the project, the Valkyrie features some closely borrowed tech from Formula One. Among the revealed performance specs, the thing which draws maximum attention is the car's all-new V12 motor, which develops 1,000bhp and to add a cherry on top, is naturally aspirated. The powerplant has been developed in conjunction with Cosworth. Coming to the specifics, the powerplant is a 6.5-litre, 65° V12 and despite being a full-stressed part of the chassis (remove the engine and there is nothing joining the front wheels to the back), weighs just 206kg. The peak torque figure stands at 740Nm. What needs to be kept in mind is that these performance figures are delivered by the just combustion-based part of the drivetrain. Being a hybrid, the figures will be further enhanced by a battery hybrid system, details of which will be revealed at a later stage. As mentioned above, the Valkyrie's powertrain borrows a lot of tech and materials from Formula One, an area where Cosworth has tons of experience. For example, like the components of an F1 engine, a majority of the engine's internals in the Valkyrie has been machined from a single material piece, such as the Titanium conrods and F1-spec pistons. To put into context the achievements of all these weight-saving measures, Cosworth’s 3.0-litre V10 F1 engines (the last before weight limits were imposed by the FIA) weighed 97kg. If scaled-up to 6.5 litres, the engine would weigh 210kg. What's more, the V12 in the Valkyrie even sounds like an F1 engine of the by-gone era and despite being naturally-aspirated, complies with all modern-day emission norms and regulations.